This is our comprehensive Teespring review where we have put together what, how & why Teespring is the best option for launching campaigns and making money online. Teespring is an online business that allows you to design your very own T-Shirt (or tank tops, hoodies, sweat shirts, etc). You can sell them as ‘campaigns’ and earn profits (you decide the profit margin) — AND — you don’t have to invest a penny to accomplish all this. Some examples of events where you could sell custom designed shirts could be high school events, club meetings, gathering, reunion, parties, birthday – or you could just design Tees for everyday use. It’s also possible to raise money by selling Tees related to natural disasters or social activisms, and use that money for charitable purpose. In short: Teespring gives you the platform; there are hundreds of ways you can use it. 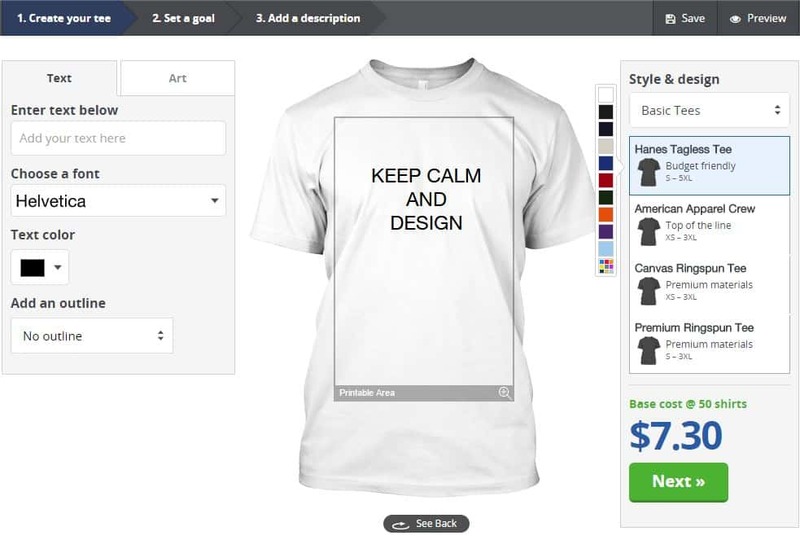 Teespring has its own browser-based designing module. You can upload your own art or work with their library of over 10,000 pieces of art and more than 50 fonts. For better results, we recommend you to design externally on your computer first and upload the PNG, JPG, or vector art. Whichever method you choose, it takes only a couple of minutes to launch a campaign and start selling your (undoubtedly awesome) t-shirts. Setting the sales estimate, profit margin and cost. After you’ve designed your awesome Tee, it is time to estimate how many of them can you sell. Remember that no Tee will be printed until the number of orders surpass the amount you specify here. This is important. But it shouldn’t be hard. Usually 50-75 pieces should be the safe side. If you feel you have a larger reach, go for it. Higher the number, higher the profit. 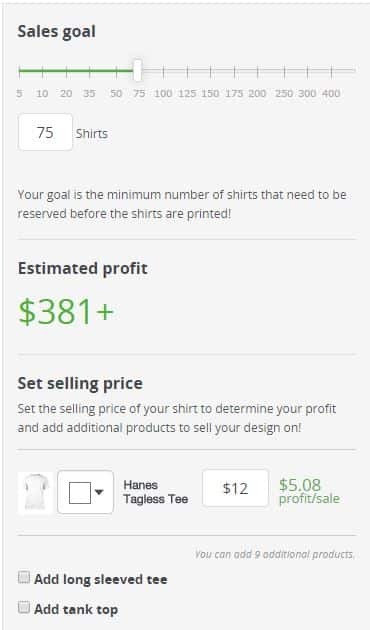 Also keep a close eye on the profit margin per shirt sold. Optimize such that the total price is reasonable, otherwise customers might not feel like ordering in the first place. 1. Design something catchy, pleasant, unique and trendy. 2. Think differently. Explode with creativity! 3. Spread your campaign among your friends and network. Explode with profits! Describe your campaign. You’re ready to go! Now that you have designed and estimated the cost, this is the last part where you have to describe what your Tee is all about. This part is optional but the better you can describe, and make it appear awesome, the better it will sell! If the goal quantity of your shirt is not met, you will not owe anybody any money. Nobody will be charged. That shirt wont be printed. Teespring spends their own money on promoting campaigns that are creative. Those campaigns sell a lot. Try to be creative! You can open a storefront. Group similar shirts under one category so it is more visible. Sometimes people tend to buy more than one shirts. Cash out is via Paypal, with no minimum cash out amount. 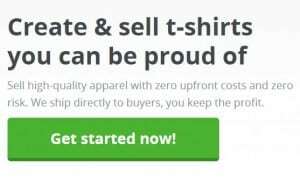 Besides your normal profits, if you wish to earn $1 additional per every shirt sold, sign up using my referral link. This Teespring review is based on my own unbiased opinions. When you use my referral link, both of us get $1 additional per shirt sold in our campaigns. If you have any opinions or queries, put them down in the comment section below. Happy designing! Does the company get a portion of your earnings? Yes, that’s their business model after all. Yes! Finally someone writes about custom printed shirts.